My early ancestors were known as Coquetdale Terriers in their native England and they worked with farmers to protect valuable livestock from the fox. I'm not very big, so I will fit into an apartment quite nicely as long as you see to it that I get to exercise every day. My hair is short and dense, so it doesn't require elaborate or professional grooming, but it needs to be �stripped' to keep it looking neat. When fully grown, I am about 10 inches tall (25.4 centimeters) and I weigh between 11 and 15 pounds (5 to 6.8 kilograms). We have no Border Terrier Breeders listed at this time. 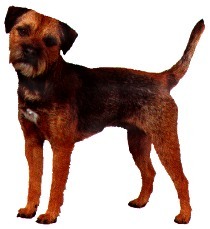 Click here to place your Border Terrier Ad!